Light green = Gärdet, dark green = other green spaces. Like Haga Park, Gärdet is a part of Stockholm’s extraordinary ring of parks. Gärdet, however, has a much different history and thus has a much different character than Haga. Where Haga is alternately rolling and manicured, wooded and leafy, Gärdet is more of a pasture-like setting of “wild” grasslands and heaths. Gärdet is vast and open and mostly flat. 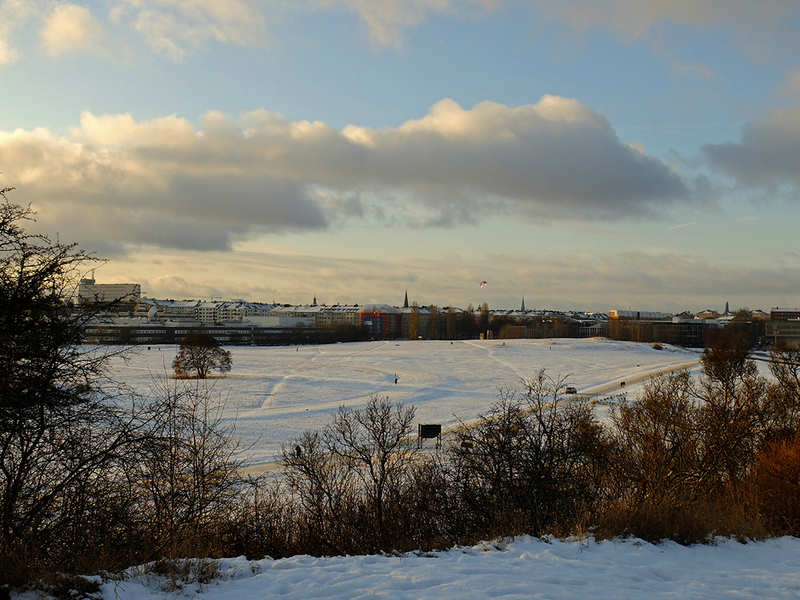 During the winters, it is filled with sledding children and cross-country skiing adults. Summertime the park is filled with joggers, picnickers, sunbathers, kite fliers, and dog walkers. Just on the edge of central Stockholm with no intermediary obstacle or boundary between city and park, the park is a much needed and much used open space. From 1672 until the 1940’s, the pastureland was used as a field for war games and military parades instead of for grazing, and during the 17th century the field's name changed to today’s Ladugårdsgärdet, or “The Barn’s Field.” The first war games in 1672 were perhaps the most extensive as an entire modern stone fortress with accompanying earth works was constructed in the field. Soldiers stormed and defended the fortress while sailors stormed the nearby beach and canons roared from the nearby hill, all under the gaze of the Crown Prince Karl XI. Thousands of soldiers and sailors took part over several days in what then was Sweden’s largest, longest, and most complex war games in history. After the games, soldiers were rewarded with beer, tobacco, and a new pair of shoes. 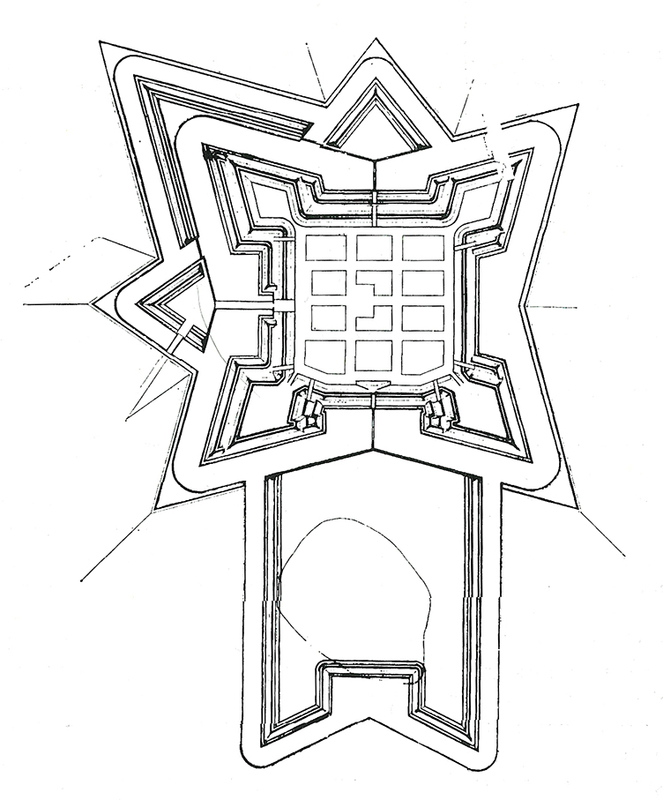 Drawing of the 1672 fortress (1). Over the next few decades, yearly summer-time war games took its toll on the fortress which was constantly rebuilt and battered again; eventually it disappeared entirely. Under King Karl XII, the fields were used as training grounds for the new recruits which fed his wars. The fields were also used as a tent camp for troops during times of civil unrest in the city. In addition to war games, training camps, and tent camps, the fields were also used for yearly parades and royal inspections which continued for the next 250 years. War games and parades were especially theatrical under Gustav III’s time in the late 1700’s, with officers and royals in full field regalia. Gustav provided indulgent evening entertainment for his entire court and the entire officer’s corps over several weeks. Stockholmers strolled out to the fields on Sundays to watch the exercises, and the fields became the sight of a yearly huge, extravagant, and drunken Midsummer celebration and masquerade ball which was open to the public. It was during Gustav’s time that Gärdet began to be regarded as an extension of Stockholm itself and began to be used by the public in their free time. King Karl XIV Johan was an especially military-interested king, and he personally led many of the summers’ war games and exercises. Huge tracts of land were leveled out to further enable the exercises and parades—low-lying swampy areas were filled and the rolling terrain was flattened. The King built a small pavilion up on a hill overlooking the fields, and he and his court lived there for weeks at a time. View over the fields from the King's pavilion. 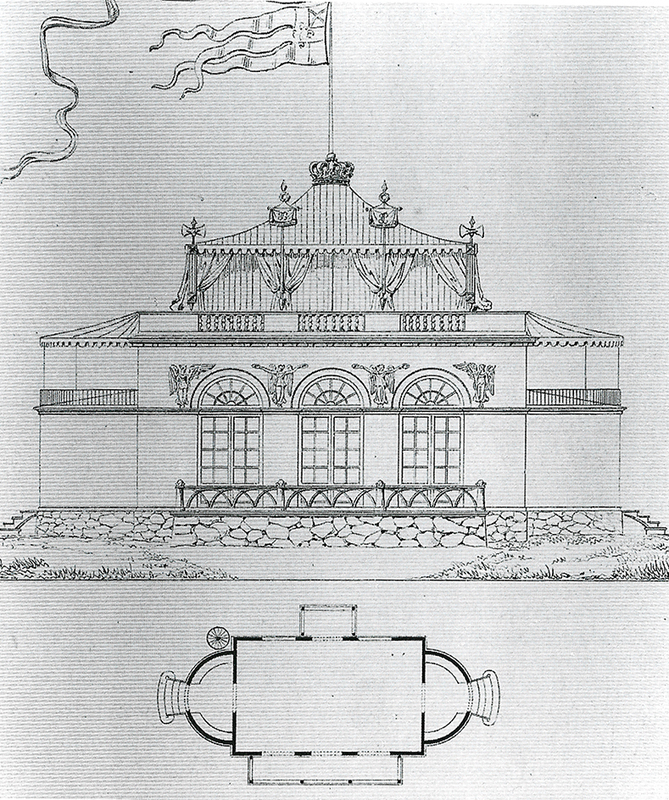 Despite its robust name, Kungliga Borgen or “The Royal Fortress” is a small, delicate, pink-painted wooden pavilion. 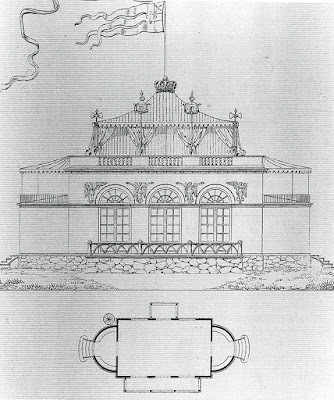 It was designed by the military officer and architect Fredrik Blom in 1818 in the Gustavian Empire Style. Kungliga Borgen, "The Royal Fortress"
When in use, the pavilion would have been slightly more impressive as the round wings and the flat roof were built out with temporary tent structures. Downhill from and behind the pavilion are a series of less impressive buildings which served to house the court, the staff, the kitchens, the horses, etc. Many of these buildings are rented out as houses today, and the pavilion is used for catered parties. Throughout the 19th century, the public continued to visit Gärdet on weekend excursions and at midsummer. Starting in 1831, horse races and public shooting contests became popular, both to participate in and to observe. The events drew huge crowds to the fields, and the crowds of civilians began to replace the military tent camps in the 1860’s as the troops began to be housed in permanent buildings around the exercise fields (more on these buildings in a later post). Even though the tent camps gradually disappeared, Gärdet was still the site of military exercises and parades through the end of the 1940’s when the military moved to a site further out of town, in Järfälla. Throughout the 1900’s, large areas of Gärdet were developed. Closer into town, a new large housing development sprang up every 20 years or so. In the 1930’s, the waterfront was lined with museum buildings. Giant, out-of-scale buildings for public institutions such as the American Embassy, the Swedish Film Institute, and Sweden’s Radio and TV further eroded the open space from about 1950-1980. Even though the military exercise fields had moved out of town, large military complexes were also built on the edges of the fields near town in the 50’s and 60’s. On the outer edge, tracts of office buildings ate into the open space throughout the 70’s and 80’s. The Film Institute and office buildings on the edge of today's Gärdet. 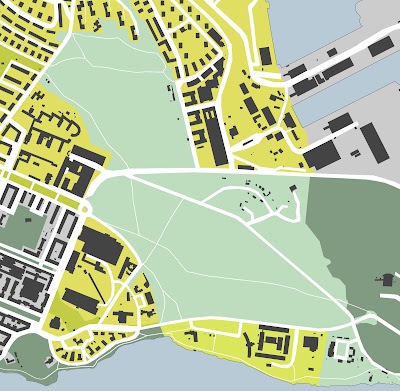 The yellow areas show how Gärdet diminished over the 20th century. 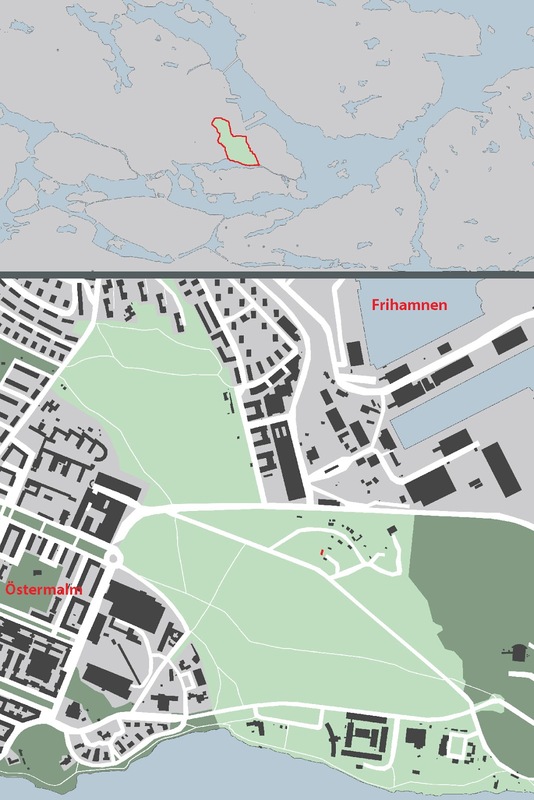 Today, like Haga, Gärdet is part of Stockholm’s National City Park, and I believe, but am not 100% sure, that further development of the open space is no longer allowed. I hope that the fields won’t be further encroached upon because Gärdet provides a strong contrast of lovely open green space to densely developed central Stockholm. I love the dense, central parts of Stockholm, but they wouldn’t be nearly as livable without the relief provided by the belt of green areas like Haga and Gärdet. Gärdet also functions as a psychological barrier between “central” and “suburban” Stockholm. Although some areas on the outer side of Gärdet are in fact more densely developed than Östermalm, those areas are distinctly characterized as suburban in the subconscious of most Stockholmers. In my post Stockholm’s Tollhouses, I described how the extinct toll boundary still defines the physical and perceptual line between central and suburban. The Östermalm area was the one exception—“central” Stockholm extends beyond the historical toll fence in this area. Instead of the toll boundary, it is the fields of Gärdet which dileneate central Stockholm. 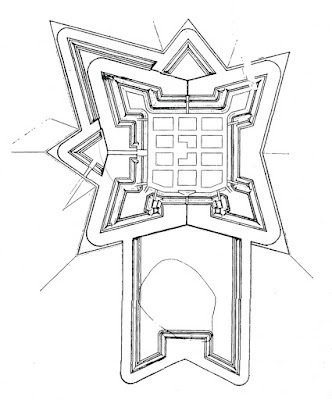 1) Alf Åberg, Skansen och borgen, Ladugårdsgärde som militär övningsplats (1969). 3) Ejnar Berg and Jan von Konow, Vyer från hedar, moar och slätter: Arméns mötesplatser och deras bebyggelse, (1996).